This massive rules-book clocks in at 238 pages, 1 page front cover, 1 page inside of front cover, 1 page editorial, 2 pages of ToC, 1 page forewords, 1 page blank,1 page SRD, 1 page back cover, leaving us with 229 pages of content, so let’s take a look! All right, we begin this massive beast of a tome with a brief piece of introductory prose to get you into the proper mindset, before explaining the basics of the system: Each character gets a series of talents, called combat talents. The number of these is defined by the class, though a feat exists that nets you an additional one. A combat talent may also be spent to gain access to a combat sphere, gaining that sphere’s base abilities and providing access to the sphere-specific talents. If a character would gain a sphere they already possess, you instead choose a talent. Saving throws, if any, are based on DC 10 + ½ BAB of the attacker + the relevant key ability modifier, here called “practitioner modifier.” If a character uses a talent, but has no class feature that defines a practitioner modifier, you default to Wisdom. Multiclass characters may use the higher of the two modifiers of their practitioner modifiers – this is important, since it retains multiclassing viability sans requiring a feat tax. Combat training nets you bonus talents that usually, but certainly not always, mirror the BAB-progression: Full BAB is equal to “Expert”, ¾ BAB-progression to “Adept” and ½ BAB-progression is equal to “Proficient.” This codifies talent-advancement in a way that is independent from the classes and easy to reference, while also providing an elegant balancing tool. Furthermore, characters may choose to exchange feat-progressions they’d gain to instead purchase Proficient or Adept combat talent progression – this, fyi, maintains compatibility with Spheres of Power. And that’s already the basis of the system! Nope, I am not kidding! It’s that simple and elegant. That being said, there is more associated terminology that we need to define, some of which you’ll know from standard Pathfinder. It is a testament to the foresight exhibited by the authors that e.g. the Attack action as such is properly defined – something that regularly causes confusion on the various messageboards. This step is also important, since some combat talents and e.g. Vital Strike, both modifying an Attack action, can be applied to the same attack. This also properly mentions the interaction, or rather, lack thereof, with e.g. Cleave and similar Standard action-based attack forms. In short: Attack action =/= standard action. The definition here also makes clear that we can expect the book to reward flowing combat, i.e. fights that do not boil down to just trading full attacks and waiting who keels over first. “Special attack actions” should also be noted – they behave pretty much like attack actions, but only one per round may be executed. This is an important balancing caveat. “Associated feats” denote feats whose effects can be duplicated by specific talents, which also means that the talents can act as prerequisite-substitutions for the associated feats. This is important once we get to the feat-groups that require a significant array of feats to qualify for and retains transparency in that regard without invalidating the feats themselves. Now, the book does something really clever with action economy to combat the tendency to constantly just trade blows. The book takes a two-pronged approach here. The first would be the battered condition, which imposes a -2 penalty to CMD and also prevents you from executing AoOs. Furthermore, certain talents have different activation actions or effects versus battered targets. The condition may be removed simply enough – the Life sphere’s restore does the trick, as do effects like lesser restoration…and here, things become interesting: You can get rid of it via taking the total defense action. This obviously costs you precious actions, but it makes sense – when we picture being subjected to a battering down, like e.g. in the original Star Wars trilogy or similar media, it makes sense that you have to collect yourself. The second approach here would be the introduction of the martial focus. Any character with a combat talent or a feat granting access, gets the martial focus after a minute of rest or after taking the total defense action. HOWEVER, you may never regain the focus more than once per round. You may expend this focus as part of making a Fort- or Ref-save to have the result rolled treated as 13, and, analogue to psionics, there is a VAST amount of options that is based on expenditure of the focus. Once more, we have an action economy game here, and one that ties into the battered condition: Since you regain the focus as part of the same condition-removing action, this encourages you to actually alternate between combat strategies. Additionally, the base ability use allows you to be more reliably competent versus things that you should be capable of evading. This modification of basic combat strategies are absolutely amazing, but the book does not stop there, not by a long shot. We also get rules-clarifications for e.g. double-barreled weapons and e.g. improvised weapon damage by size. Similarly, unarmed damage now scales independent of class, which is a huge plus as far as I’m concerned. The number of talents the character has governs the damage inflicted. Now, the book does not just leave you in the dark regarding actual expressions of martial arts in the game world. You do not have to read and digest the whole book to start using it: Instead, we begin with a massive chapter of martial traditions, some of which are gained as part of the proficiencies of a class. This codifies basically a talent array for you, not unlike e.g. combat styles of the ranger class. One could also see them as thematic suggestions and the book provides notes on designing your own martial traditions. This section, beyond codifying mini-talent-trees, can also be seen as a perfect guideline for your own tinkering. Want to have a shield master? Check the tradition. Steppe rider? Suitable talents noted. I love this. Now, the book contains no less than 8 new classes. If I analyze these in the level of depth that I usually go for, then this review will become a bloated 30-plus-pages monstrosity, so I’ll be a bit briefer than usual. The first class would be the Armiger, who gets d10 HD, 4 + Int skills, full BAB-progression, good Fort- and Ref-saves, proficient talent progression and may choose a mental attribute as practitioner modifier. This would also be a good time to note that classes here grant e.g. a martial tradition when taken at 1st level – this provides access, obviously, but also prevents multiclass-cheesing. The armiger is obviously inspired by games like the latest Final Fantasy, centering around the idea of customized weapons, each of which grants a sphere and talent – basically, you have combat modes hard-coded into the class, and no, you can’t cheese that with dual-wielding. Only one customized weapon grants its benefits at a given time – though TWFing with them, obviously, is still possible. The class also gains options to cycle through these special weapons, which also improve. The low general progression regarding talents is offset by the modes, making this an inspired class. I really, really adore it. The blacksmith get d10 HD, 4 + Int skills,full BAB-progression, good Fort- and Will-saves as well as Expert martial progression, with Constitution as governing practitioner modifier. The blacksmith is obviously somewhat equipment-themed and can provide benefits to allies by finetuning their equipment, basically providing 24-hour buffs. They also are sunder/anti-construct specialists, gaining scaling bonus damage and later learning to damage natural armor/weapons. The class also has some serious crafting prowess going on and the class receives an array of smithing insights that can provide e.g. Gunsmithing, damage objects to hurt their wielders, etc. He can also learn to reforge items, which is pretty cool. The commander gets d8 HD, 6 + Int skills per level, ¾ BAB-progression, good Fort- and Will-saves and Adept martial progression, with Int or Cha as governing practitioner modifiers. Now, there are a couple of really good, commander-style classes out there. As far as favorites are concerned, Amora Game’s battle lord from Liber Influxus Communis, and, obviously, Dreamscarred Press’ Tactician come to mind. Where the former is a leader from the front, the latter is a coordinator defined by a psionic network and psionics. The commander is, chassis-wise, closer to the latter. The commander actually has next to no overlap with both: While tangible and potent benefits for allies are the bread and butter of these fellows, we also have terrain-specific tricks and logistics specialties – these provide really uncommon and intriguing benefits that focus on adventuring beyond combat. This class is fantastic. Love it to bits. The conscript gets d10 HD, 4 + Int skills per level, full BAB-progression, good Fort- and Ref-saves as well as Expert martial progression, governed by one of the mental attributes. This is basically the “build your own” SoM-class type class. From dual identity to banner to studied target, it allows you to customize options galore and also comes with sphere specializations, basically bloodline/domain-ish linear ability progressions that kick in at 3rd, 8th and 20th level. This is the class for the folks who want a certain skillset be viable sans requiring a ton of multiclassing shenanigans. The scholar gets ½ BAB-progression, good Ref- and Will-saves, d6 HD, 8 + Int skills per level and proficient martial progression governed by Intelligence. Beyond being capable of providing some healing, we get flashbangs, DaVinci-style gliders, etc. – this is basically the Renaissance ideal of the universal scholar, embodied as a class. Super helpful, versatile, interesting – and perfectly capable of working in even no/low-magic games. That is not to say that this fellow is not viable in your regular fantasy setting though! I really love how the system allows you to play a really smart, versatile non-magical scholar. Another huge winner. The sentinel gets d12 HD, full BAB-progression, good Fort- and Will-saves, 4 + Int skills per level, as well as expert martial progression, using Wisdom as governing practitioner modifier. The class, unsurprisingly, is the tank of the roster, and is an actually viable defensive base class. It is pretty technical in comparison, but comes out rather nicely. I am not a fan of the decision to be able to use Wisdom bonus instead of Dexterity to govern the one, at least pro forma, bad save of the class, but the capping of class level here prevents low level characters with universally good saves. Otherwise, the focus on challenges, ability to lock down targets etc, is nice., and stalwart, one of my least favorite abilities in all of Pathfinder (evasion for Fort AND Will) is relegated to 9th level. So yeah, I enjoy the class more than I figured I would! The striker gets d10 HD, 4 + Int skills per level, good Fort- and Ref-saves, full BAB-progression as well as Expert martial progression governed by Constitution. The class is something of a monk-ish specialist, but that, at least in theory, sounds less interesting in the system, with monk-ish powers not more broadly available. Well, instead of just slapping several talents on the class, the striker takes a different approach: It is, in essence, a mana-bar martial. Let me explain: The striker has a resource called “tension” that increases upon taking damage, upon successfully hitting creatures, and upon moving a lot. This builds and may be expended to generate special effects, with the class gaining striker arts, which can provide unique effects or expand the ways in which you can spend the resource. And no, you can’t hoard it out of combat, and it doesn’t have a dumb per-combat mechanic. The playing experience here is really interesting and fun – but from all the classes, this is one that has the most expansion potential. Basically, you have a cool resource-management game in addition to the spheres-engine, making this a surprisingly strategic class to play. Finally, there would be the technician, who receives d8 HD, 6 + Int mod skills per day, good Ref- and Will-saves, 3/4 BAB-progression as well as adept martial progression governed by Intelligence. This class takes up no less than 18 pages, and it is a BEAST. This is, in essence, the practical inventor to the scholar’s more theoretic approach; the sapper, the golemsmith, the pulp fantasy exploring inventor. It is the most complex class herein and the one that requires the most amount of system mastery, but it rewards you for allowing for an impressive amount of different concepts being realized even before you begin diving into the depths of the spheres system. Now, the book also contains a ton of archetypes for your perusal: Alchemist, antipaladin, brawler, cavalier, fighter, gunslinger, hunter, investigator, magus, monk, paladin, ranger, ninja, rogue, samurai, slayer, swashbuckler, thaumaturge and even the vigilante get their due here, and that is before we take a look at the archetypes for the new classes, some of which made me smile from ear to ear. Battlefield armigers, for example, modify their chassis to instead make an improbable weapon, like an axe-bladed crossbow or the like. The iron chef blacksmith is a neat take on the battle cook, while the techsmith provides the means to poach in the technician’s playground, while doctor or slime savant scholars make for meaningful tweaks of the base engine of the class. Some of these tie in with the spheres system to a rather impressive degree, with e.g. the adamant guardian changing the focus of the sentinel from challenges to patrols, while another interacts with the berserker sphere. There also would be basically a true neutral paladin-ish variant here. Striker can opt for blackpowder or mutation specialties, and expert shadowed fists, scouts and grappling specialists are covered here as well. Technicians may elect for the mad scientist archetype (yes, you can make shrink rays…), and a suit pilot and basically a mythbuster can also be found here. The whole classes/archetypes-chapter has been a huge surprise for me. You see, as much as I like Spheres of Power, I’m not the biggest fan of its classes. To me, they always felt like vessels to conduct the sphere-engine, not like truly distinct concepts that would make me go for them on virtue of their own engines. This book does not suffer from this limitation. I absolutely would love to play, in slightly varying degrees, all the classes introduced within this book. There are a TON of amazing concepts here and the engines presented for the classes are actually compelling and interesting BEFORE you start adding the sphere-engine! Furthermore, the classes herein allow you to do unique things that set them apart before diving into sphere-selection. That is a huge plus as far as I’m concerned. Add to that the fact that the classes actually manage to present compelling engines that reward versatile playstyles even before the main meat of the system is in place, and we have what must be called a resounding success. Now, approximately 60 pages are devoted to the respective spheres. I cannot go into in-depth analysis regarding all of them here, but to give you an idea of the different spheres: Alchemy, athletics barrage, barroom, beastmastery, berserker, boxing, brute, dual wielding, duelist, equipment, fencing, gladiator, guardian, lancer, open hand, scoundrel, scout, shield, sniper, trap, warleader and wrestling would be the spheres. Alchemy nets you options to improve classic items, fused grenades, condition-healing, stimpacks, etc. Athletics sports concise rules for climbing around on big foes, wall run, etc. Barroom covers your improvised weaponry and drunken master tricks. Berserker, much like in the Fate/Stay-series, is about staying power and destroying stuff. Boxing features a nice counter-mechanic. Brute nets you Hulk-like stomps, topple foes, etc. and gets manhandle options to add further debuffs. The duelist sphere has a well-designed bind weapon-mechanic and can generate nasty bleeding. The equipment sphere sports the item-specific tricks. Now, I am not the biggest fan of the Fencing sphere’s Parry and Riposte, as it is based on an opposed attack roll, but its use of martial focus prevents the mechanic from bogging down gameplay. Gladiators are specialists of boasting and demoralizing targets, the former allowing for actually tangible benefits. Guardian has two packages – challenge and patrol, the former of allows you to kite, while the latter lets you set up a defensive perimeter of sorts. I really enjoy this sphere. Lancer also is really cool, providing concise mechanics for the impalement of targets, making spear-wielders etc. more interesting and viable. Open palm and scoundrel are pretty self-explanatory, while the scout sphere focuses on keen perception, taking abilities usually relegated to rangers and characters that fit the ranged specialist or detective trope and makes them more universally viable. The shield sphere allows you to spend AoOs to increase AC and makes the often maligned item class more viable. Huge plus there. The Sniper sphere is something I have NEVER seen before for Pathfinder: It is a BALANCED, yet potent option for the sharpshooter concept. Thanks to essentially bonus damage for single shots, trick shots and the like, it is actually very well made. It even has a viable, powerful, yet balanced variant on the headshot-concept. The trap and wrestling spheres and warleader spheres do what you’d expect them to. It should also be noted that some sphere nets you 5 ranks in an associated skill, with progressive levels providing further boosts at higher levels. Snipers can shoot into melee sans penalty, etc. – you get the idea. The chapter, as a whole, is inspired. I do not envy the designers that will work on e.g. expansions to impaling options, for example, as the engine is VERY concise and could break if handled without due care, but as a whole, this chapter must be, once more, considered to be a resounding success of epic proportions. Now, this would be as well a place as any to comment a bit on the design paradigms employed and what they mean for you: Spheres of Might did not attempt to offset caster/martial disparity. This feat is only possible by making martials ridiculously powerful and allowing them to basically behave like casters. And if you do want full-blown responses for every eventuality, why not play a caster in the first place? I believe, firmly, that playing a caster and a martial character can and should be somewhat different playing experience. The central issue with martials lies in a plethora of design decisions of the core game. Low skills per level meant less out-of-combat usefulness, which hampers roleplaying. Spheres of Might addresses that and fixes it. More importantly, though, the system’s focus on iterative attacks makes single target damage seem like the end-all raison d’être for martials. There’s a reason so many threads focus on improving AC, damage output, accuracy, and the like. The issue at the root of a lot of player-frustration with regular martial characters does imho not lie in their potency, but rather in the playing experience itself. It simply isn’t that interesting to walk up to a foe, roll X standard attack rolls for as much damage as possible, rinse and repeat. GMs will need, in such cases, to focus on mobility of foes or start a numbers-race that isn’t fun for anyone. And yes, you can accumulate a variety of different options for martial characters, but it takes time, feat-investment, etc. In short, you’ll still be doing your specialized routine. Very well, granted, but the experience can still be somewhat stale. This issue can be further exacerbated by certain classes having what conceivably should be general notions, hardbaked into the chassis, making some martial classes always exceed others in their available options for certain ability-trees. This changes the playing experience all on its own and supports a rather impressive array of playstyles that are simply less rewarding without this system. But what if you actually *do* want high fantasy, potentially perhaps more significant boons that those assumed by your average Pathfinder adventure? Well, that’s where the book thankfully takes a cue from Spheres of Power: The high-powered, truly potent and more fantastic options are found in their own chapter, codified as legendary talents, organized by sphere. Here, you can, for example, find double jumps à la Devil may Cry, leaving speedster-style afterimages, the rules to make a philosopher’s stone via alchemy, execute Final Fantasy-style dragoon leaps, infinite ammo, generate a staircase of arrows/bolts, fire-breathe alcohol, instantly call animal allies to your side, rip open space and time, generate cyclone cut dual-wield effects, etc., generate vacuum with your strikes – you get the idea. Basically, this chapter includes the more over-the-top, fantastic options. The decision to distinctly set these apart if one of my favorite components in Spheres of Power, and I am glad it was retained here. So yes, you can have your cake and eat it, too. We also get a couple of new feats (and ones referenced, meaning you won’t have to skip books – kudos!) as well as an assortment of new traits and a ton of favored class options. These deserve special mention, for they seem to follow the design paradigm that class/race combos that are slightly less optimal should gain slightly better FCOs. I like that. The book also contains new drawbacks and sphere-specific drawbacks, which can further help customizing martial traditions and differentiate between schools. The equipment section includes some stuff that made my southern German heart swell – I know I need a battle stein! And yes, 10-foot-pole as codified as weapons. Never leave home without it! A few weapon mods and magic components can also be found here. Now, the book does not leave the GM sitting alone in front of the book. Advice on running cinematic combat, martial monster tactics and talents and traditions – all concisely explained. The book also contains a massive bestiary (CR 1 – 21) of sample monsters modified to use the system and furthermore features an NPC-codex. Oh, and that’s not all. The final chapter provides a surprisingly tight conversion appendix for Starfinder, which is a definite plus. At the same time, applying the concise conversion notes will take time. Furthermore, while Starfinder is similar to Pathfinder, it is still its own beast, and frankly, I found myself wishing we’d get a full-blown version of the book dedicated exclusively to Starfinder. The conversion guidelines are better than I anticipated, but ultimately, they represent a graft for a system for which this wasn’t necessarily intended. Editing and formatting, while not perfect, are pretty damn close. The proof-readers did a very good job here, particularly considering the massive crunch-density of this ginormous tome. Layout adheres to a solid two-column full-color standard and the interior artwork is significantly better than in any other Drop Dead Studios book I’ve read so far. The pdf version comes fully bookmarked for your convenience. I do not (YET!) own the print version, so I can’t comment on its merits or lack thereof. …ah, who am I kidding?? This is a frickin’ masterpiece, pure and simple! Yes, I am not a fan of every single design decision herein, but I adore A LOT about this book. As in 99.999% of it. As in: O M G, this is amazing. Spheres of Might is a jack-of-all-trades in that it allows for a wide array of different character concepts, but more than that, it actually enhances the experience of playing non-casters by making them significantly more rewarding. The classes are more inspiring than the vast majority of stand-alone classes you can purchase. The very engine this champions enhance the game all on its own, and the design of these martial spheres deserves lavish praise. More than even spellcasting, this completely tweaks, redefines and imho improves a central aspect of the game we all know and love. 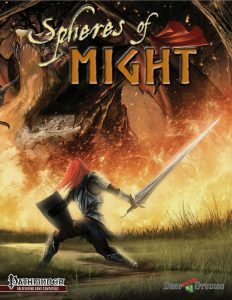 Spheres of Might is one of the most inspired, well-crafted books of crunch I have ever read. It is not only well-made, it truly inspired whole settings, while campaign-ideas. Every single aspect of this book, every chapter, sports some truly remarkable ideas and gems. This surpasses Spheres of Power, a book I absolutely love. The final verdict, hence, should not surprise anyone: This is 5 stars, gets my seal of approval, and is a hot contender for the number one spot of my Top Ten of 2017. Furthermore, this tome represents such an impressive improvement regarding versatility and playing experience quality, that it receives my EZG Essentials-tag – this book should be on the shelf of any self-respecting pathfinder GM. You can get this milestone, this masterpiece, here on OBS! You can support Drop Dead Studios making more Spheres-content (for now, Spheres of Power, though!) here on patreon! That review hurt my brain… too many numbers!